At a browsing distance, the charm bracelets from design house Evolve invite you to come in close and enjoy their skill, colouring, and splashes of humour. Detailed componentry and story-telling underpin these charms which are like collectors’ items. The silver charms are modelled as flowers, birds and fish, as well as quirky items like the Daisy Cow, the caravan, the Combi van and the suitcase for travel. Also worked in silver are representations of attributes like strength, protection and heritage done with Maori motifs. The deeply-coloured glass charms are named after places – Taupo, Waiheke, Abel Tasman, Fox Glacier, Coromandel etc. They are not pictorial representations by any means, but more like small, rolled up Impressionist paintings. To work out which glass bead represents which location, you consult the illustrated catalogue produced by Evolve. In terms of craftsmanship, each item talks of care and thoughtfulness. The silver charms begin as large drawings which are then turned into models done in hard wax. From here, a silver ‘master’ is made using the centuries-old ‘lost wax’ foundry technique, and this master is used to manufacture the charms which are then polished and finished by hand. Pages of drawings which may well be later discarded precede what will become finished works. To offer opportunity for others to contribute, Evolve has entered the world of competition where designers are invited to present their ideas for possible fabrication. 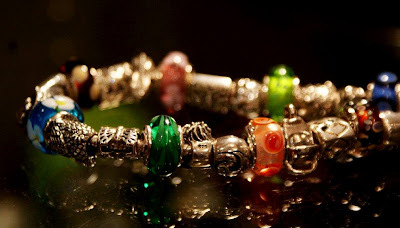 The brilliant glass comes from the Italian Murano factory – arriving as coloured rods which then undergo softening, the addition of differently coloured swirls and drops, then fused onto the silver rim ready to be threaded onto the bracelet.